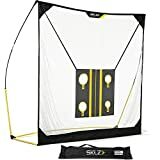 Users will be delighted to know that these golf practice nets are very easy to set up the either in their garage or their backyard, and this allows them to begin practicing immediately. It is understandable that these nets are made to be very durable so that they can withstand impact received from balls at practice and will continue to break expectation. When it comes to major brands you get what you pay for. Despite carrying a hefty price tag, it also sports quality and a very hassle free installation that allows users to pick it up out of the bag and have it set up within minutes! Some of these tools can do what other nets cannot as it actually returns the ball straight from the point of impact and allows users the freedom to only use one ball for practice as opposed to having 100 or so balls compared to other nets. Practice your driving, chipping, and approach shots without heading to the driving range with this three-in-one golf practice set. Equipped with a driving net, chipping net, driving mat, and nylon carrying bag, the set includes everything you need to hone your golf game in your backyard. Callaway Home Range practice bundles are available in 2 sizes and configurations. The Standard version includes a 6 foot Tri-Ball hitting net, FT Launch Zone hitting mat and ball shagger. All your practice needs in one convenient package. When it comes to Callaway, you normally get what you pay for. Despite carrying a hefty price tag, it also sports quality and a very hassle free installation that allows users to pick it up out of the bag and have it set up within minutes! There may be other alternatives out there but with Callaway, you only get the best. Callaway Tri-Ball Hitting Nets are available in 3 sizes and are made with the strongest netting in golf. It's unique shape supports practice for all clubs in your bag - from driver through wedge. Easy to set up and take down. Perfect for indoor or outdoor use. Includes nylon carry bag for easy transport and storage. The Champion Sports Oversized Multi-Sport Net can be used for many different training activities. Measuring in at an impressive 7ft H x 11ft W x 5.6ft D, this large net is perfect for practicing your golf swing, running hitting and pitching drills, as a soccer goal net, or for football throwing practice. The Multi-Sport Net even comes with a nylon carrying case for easy transport! This multi-sport utility net is great for any type of outdoor sport practice such as golf tennis teeball or more. Large 8 foot high by 10 foot wide net is supported by a flexible aluminum and fiberglass frame with shock-corded strength. Outdoor design is best supported by burying 6-8 inchbelow the dirt or grass surface. Patented pop up design. All weather material. Folds to fit in most golf bags. All IZZO products come with a 1 year manufacturer warranty that includes defects and workmanship. Attentions Golfer's: sharpen your skills with the ultimate folding chipping basket This collapsible chipping net goes from a 23 inch diameter frame into a 7 inch diameter. It features 3 chipping baskets for the ultimate challenge, and it is great practice tool for any golfer at any level. The ProReturn Net is now the most versatile and practical net out there. The ProReturn Net combines all the attributes of the best practice nets. The unique shape of the inside net catches your shot before rolling it back to you. Super fast set-up with spring steel frame that pops open, and folds down in seconds. Users will be delighted to know how easy it is to set up the net either in their garage or their backyard and begin practicing immediately. It is understandable that the net is made to be very durable so that it withstands impacts received from balls at practice and will continue to break expectation. Using a revolutionary patented design, the Quickster represents the most convenient and efficient multi-sport net ever created. Takes only 90 seconds to fully assemble, and even less to take down. The large coverage space and included golf target allows golfers to practice all types of swings without needing a range or course to do so. Swingbox has a very small footprint. It covers angles that golf nets cover, but because so close, the size can be much smaller. It is smaller than any other golf hitting net. Great for indoors. Because it can be placed 9 inches away from a wall, even a small 8 by 10 room becomes a potential site for Swingbox. This tool does what other nets do not, it actually returns the ball straight from the point of impact and allows users the freedom to only use one ball for practice as opposed to having 100 or so balls compared to other nets. Players will get a blast from playing with just one ball and only having to change their clubs. Nets don't get nicer than this. It's a whopping 120 inches x 78 inchesx 72 inches!!! The great thing is that it's portable! The net is a pop-up style and folds into a carry bag. Also makes a great backstop for chipping and short pitches. Our Callaway Home Range practice bundles are available in 2 sizes and configurations. The Standard version includes a 6' Tri-Ball hitting net, FT Launch Zone hitting mat and ball shagger. Izzo Golf Mini-Mouth Chipping Net With a 24" chipping target, this net fits perfectly in smaller spaces. Features ? Patented pop-up design ? All-weather material ? Folds to fit in most golf bags ? Opens in an instant, closes in a snap If you have any questions about this product or would like to order by phone, please call us Toll Free at 888-733-8383. We look forward to hearing from you!! Use the Quickster Golf Net to perfect your swing and lock down your technique. This ultra-portable training net allows you to plan your practice around your schedule. You no longer need a golf course, or a driving range in order to perfect your sport. Made of durable 2-ply nylon netting, it can withstand a ball speed up to 175 mph. The SKLZ Quickster Golf Net won’t let you down as you drive the ball into the net time and time again. With simple and easy setup, this ultra-portable, lightweight net can be ready to go in as little as 90 seconds. Due to the composite steel and a fiberglass Tension-Tite frame, this net is made to last. The included target allows you to focus on your aim, hand eye coordination, and dialing in your skill. When you’re done with practice simply store it in the easy to carry storage bag. With SKLZ you can be confident that your game is on target. This is a fantastic new golf practice net cage for any golfer to practice outdoors in the comfort of their own home! Lower your golf scores and Save Your Dollars on the trips to the golf driving range! Use your golf clubs for hitting as many balls as you like in your own backyard with this new golf net training equipment. Golf Practice Net Features: Easy set up ready for hitting practice in minutes. Shock-corded fiberglass poles with protective sides to stop wide shots. Golf net storage bag and ground stakes included. Durable long life nylon mesh net with backdrop target. Free standing and easy to set up. It's your take anywhere golf driving range in a bag, it's light weight and small in size when closed. Durable shock corded frame and backstop safety feature. Don't wait to go to the driving range to practise with your golf clubs. Great for outdoor use. Can be staked into the ground on windy days. Golf practise net opens to 10 ft Width, 5ft Deep; 7 ft Height The instant golf ball hitting net's massive size and backstop safety feature mean no more "past balls." The Golf Practice Cage folds for easy storage into a portable duffel bag included at no extra charge! Free standing, durable, multi-sport practice cage Great for indoor and outdoor use Save time and money avoiding golf ranges Resistant shock corded frame and backstop safety feature Dimensions 10' W x 7' H x 5' D Retail price on this unit is $149.99 THESE NETS ARE WIDE ENOUGH TO SAFELY CATCH EVEN POOR SHOTS! IT'S YOUR OWN PERSONAL, PORTABLE, DURABLE DRIVING RANGE! PRACTICE GOLF MORE, LOWER YOUR SCORES! QUALITY GIFT FOR THE GOLFER IN YOUR LIFE! Attentions Golfer's: sharpen your skills with the ultimate folding chipping basket This collapsible chipping net goes from a 23" diameter frame into a 7 " diameter. It features 3 chipping baskets for the ultimate challenge, and it is great practice tool for any golfer at any level. 1' x 6' putting mat, automatic ball return with storage bag. Easy to store, take with you and prepare for play in your home, office or anywhere that you want to take the putting mat. Multi-sport athletes dont need to have tons of training materials for each individual sport anymore thanks to the Multi-Sport Training Screen from Champion Sports. Use the screen to kick soccer balls, catch pop flies and grounders, pass a basketball, or for just about anything else you can think of. This large screen is 52in W x 72in H. The 1 1/4in steel frame features heavyweight nylon netting and a square target to help with aim and accuracy practice. Take your team's training session on the go with the Champion Sports Multi-Sport Net. Whether you're practicing taking penalty kicks, increasing your players' pitching speed, or just getting warmed up for golf season, this over-sized net provides plenty of space to hone your skills. The multi-sport net has a square red target in the centre to help improve accuracy, and it comes with a convenient carrying case that makes it easy to transport from one location to the next. This multi-sport, multi-use utility net is great for any type of outdoor sport practice such as golf, tennis, soccer and more. The large 7' high by 9' wide net is supported by a flexible aluminum and fiberglass frame with shock-corded strength. This outdoor design is best supported by burying 6-8" below the dirt or grass surface. Our Callaway Tri-Ball Hitting Nets are available in 3 sizes and are made with the strongest netting in golf. It's unique shape supports practice for all clubs in your bag - from driver through wedge. Easy to set up and take down. Perfect for indoor or outdoor use. Includes nylon carry bag for easy transport and storage. Have a few minutes to kill on your lunch hour?Are driving ranges not in your area or are the price of a bucket of balls getting ridiculous? Are plastic golf balls not giving you accurate testimony to your swing? Not to worry! Nets don't get nicer than this. It's a whopping 120" x 78" x 72"!!! The great thing is that it's portable! The net is a pop-up style and folds into a carry bag. Supplement your range work. Also makes a great backstop for chipping and short pitches. Looks good and should far outlast the other nets on the market. Some other nets include a tubular frame and netting and that's it. Netting tends to shred over time and, even though a target may be painted on the netting, it is still difficult to see before and after your shot. If you are trying to improve your game, why not clearly see where you are hitting your ball? 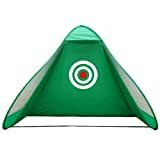 This quality golf net is made of flame-resistant nylon material, the same as camping tents. A springed frame makes set up and tear down a matter of a few minutes. Seven stakes and 4 metal anchors are included for safe, secure stability of your golf net. Don't worry about the wind taking this one! Also included are 4 tie-down nylon cords, all of which come in a small carrying bag, which fits in a pocket in the larger bag, which carries the net itself. Inside the net is an inner cloth target, a black bullseye, so there's no mistaking where to aim. This extra feature will dramatically reduce the abuse to cage netting you will find with other nets without that extra lining.